Aira Horizon Smart Glasses — black, with dark shades, a center-mounted camera and a silver and blue Aira emblem on the side. Nearly 60% of Americans take prescription drugs. Correctly reading the dosage instructions and other information printed on their labels is vital. Aira develops transformative remote assistive technology that connects the blind with a network of certified agents via wearable smart glasses and an augmented reality dashboard. The agents serve as visual interpreters for people who are blind, helping them accomplish a wide range of tasks and activities including navigation, entertainment, work tasks, running a marathon, or reading a bedtime story. One of the most requested features among Aira’s customers is medication recognition. With this in mind, AT&T is currently helping Aira develop a recognition solution that utilizes Hey Chloe™, Aira’s new artificial intelligence (AI) platform, to correctly identify prescriptions and over-the-counter medications. 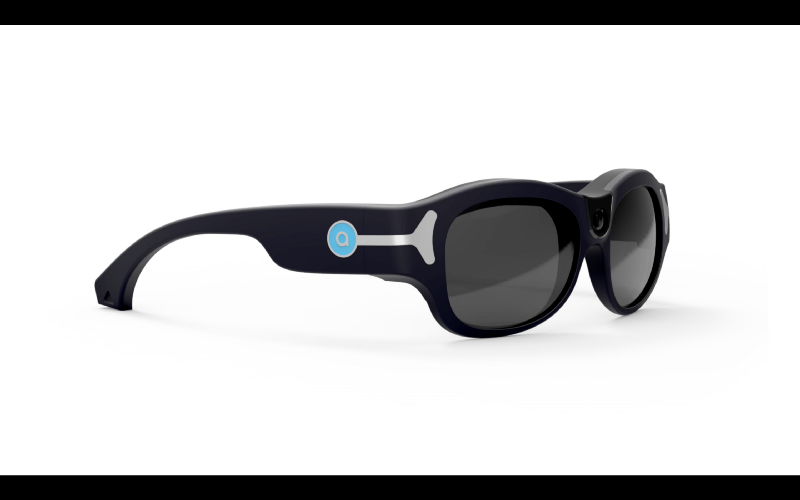 Aira Horizon Smart Glasses — black, with dark shades, a center-mounted camera and a silver and blue Aira emblem on the side. Aira’s medication reader will be available for use in conjunction with Aira Horizon Smart Glasses, Aira’s next generation wearable using Voice First technology. Available in May, Aira Horizon Smart Glasses have built in “Hey Chloe” functionality and will come paired with an Aira-dedicated smartphone, powered by AT&T, unlocking Aira’s technology for the 58% of U.S. seniors who do not currently own a smartphone. Horizon will provide an integrated, connected solution that enables people who are blind or have low vision to take advantage of the Aira service, regardless of whether they already own a smartphone. For a preview of the pill bottle reader solution and Aira Horizon, visit the AT&T booth (#5832) at HIMSS18 or go to the Connected Marketplace to learn more about Aira Smart Glasses.